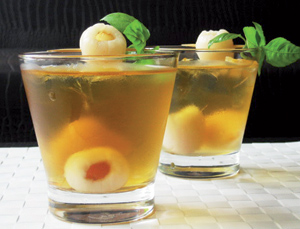 Delicious and juicy Lychee or “Litchi” reminds you the arrival of summer. Botanically, this exotic fruit belongs to the family of Sapindaceae and named scientifically as Litchi chinensis. The L. chinensis is a tropical type fruit tree native to low elevations of the provinces of Kwangtung and Fukien in Southern China. It is a slow-growing medium sized evergreen tree with dense, round-topped foliage, and smooth, gray, brittle trunk and branches. It may reach 40-50 feet height. Litchis, not only eye-catching in spring when the huge sprays of flowers adorn the tree but also is a stunning sight for nature lovers when the tree is full of berries. Its outer surface is covered with rough leathery rind or peel featuring pink color. The peel can be easily removable in the ripe fruits. Inside; consists of edible portion or aril that is white, translucent, sweet and juicy. The fruit has sweet, fragrant flavor and delicious to savor. The pulp has single, glossy brown nut-like seed, 2 cm long, and 1–1.5 cm in diameter. The seeds, like in sapodilla, are not poisonous but should not be eaten. Fresh lychees are readily available in the markets from July to October, about 120-140 days after flowering. Lychee fruits are low in calories, contains no saturated fats or cholesterol, but rich in dietary fiber which, can be very important for individuals who are concerned about their excess body weight. 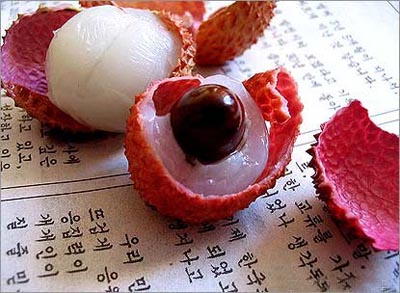 Research studies suggest that oligonol, a low molecular weight polyphenol found abundantly in lychee fruit. Oligonol has been found to have several anti-oxidant, anti-influenza virus actions. In addition, it helps improve blood flow in organs, reduce weight, and protect skin from harmful UV rays (Takuya Sakurai (Kyorin University, Japan), Biosci. Biotechnol. Biochem., 72(2), 463-476, 2008). Lychee, like citrus fruits, is an excellent source of vitamin C, and contains approximately 40 percent more vitamin C than orange. Studies suggest that consumption of fruits rich in vitamin C helps body develop resistance against infectious agents and scavenge harmful, pro-inflammatory free radicals. It is a very good source of B-complex vitamins such as thiamin, niacin and folates. These vitamins are essential since they function by acting as co-factors to help body metabolize carbohydrates, protein and fats. Litchi also contains a very good amount of minerals like potassium and copper. Potassium is an important component of cell and body fluids help control heart rate and blood pressure; thus offers protection against stroke and coronary heart diseases. Copper is required in the production of red blood cells. Lychee is considered Diuretic and Digestive. It is a good source of carbohydrates and fiber, which are quite essential for the body. 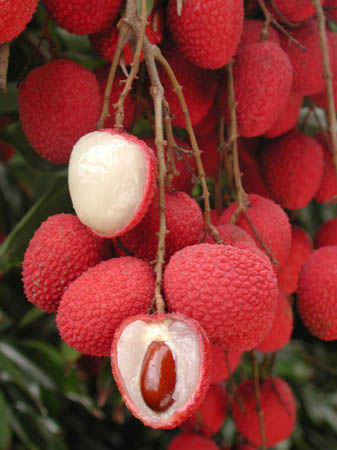 Fresh lychee fruits are available in the markets from June to October. The Fruit must be allowed to ripen fully on the tree itself since the ripening process stops soon after harvested. Overly maturity makes them turn dark-brown in appearance and lose their luster and flavor. While harvesting, snip off entire fruit brunch, keeping a short piece of the stem attached. In the store, choose fruits that feature fresh, without cuts or molds. Litchis have very good shelf life. Fresh fruits can be kept at room temperature for up to five days and can be stored for up five weeks in the refrigerator. They can also be frozen or dried and canned for export purposes. Herbal Tea or White Tea (buds and/or young tea leaves [lowest in fluoride levels], 3x more anti-oxidants than green or black tea which contains high levels of fluoride). 2. Fill half a glass with ice and add couple of lychees from can or fresh. 3. Add 2 Tablespoons of lychee syrup from can, or add natural sweetener of your choice. 4. Add a drop of jasmine flavoring (optional). 5. Add the chilled tea. I love making jelly from lychee… it’s so yummy! 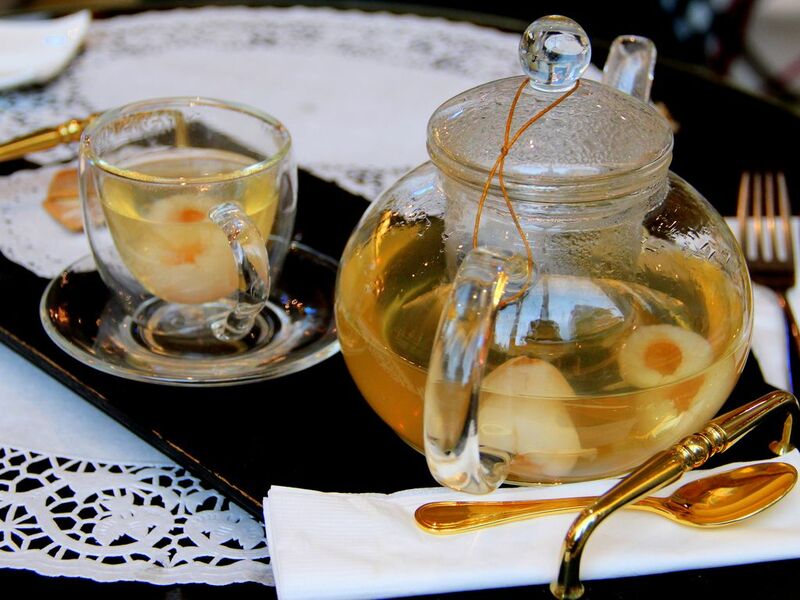 I love lychees, but never thought of using them in recipes – I like the sound of the tea! 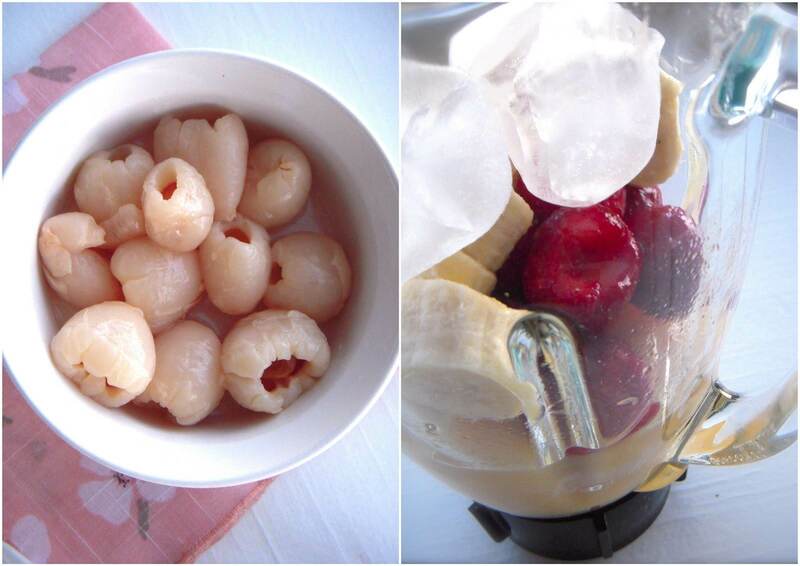 I love to peal the lychees and freeze them for a wonderful cooling snack! I am going to try the banana lychee smoothy. nice post and good idea. i will recommend to a website that want to share knowledge about this fruits i will share your ideas too related to this topic. The culture of sharing is good. Reblogged this on Homeopathyginatyler's Blog.